We can all agree that biltong tastes delicious – no protest. This culinary delight has invaded European, American and Australian markets in recent years. But what about the nutritional value? Let’s talk about nutrients, numbers and reasons that surround biltong and it’s impressive health benefits. As the concept of healthy eating is taking the world by storm many people try to find alternatives to snacks like crisps and fries. This is where Biltong comes into play! It is the perfect replacement for those of us that love to mindlessly snack in front of the TV, as it has no carcinogenic ingredients! Plus it’s extremely low in fat. Lean biltong contains just 3% fat in a 25g serving. A 25g serving gives you 50% of your daily protein requirement. 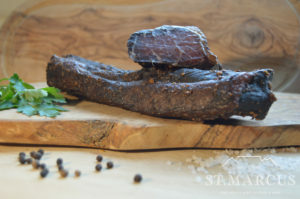 Biltong is also a low-carb meat product, as it’s key ingredients are pure and simple: vinegar, black pepper, salt, coriander, sugar, and meat. There’s no chemical content to it, no artificial colouring, flavours and preservatives or E-Numbers or even MSG in St. Marcus Biltong! Nutritional experts claim that Biltong is better than jerky! They claim that the air drying process guarantees its core nutrients are retained, instead of being cooked out. It’s also specifically rubbed with salt and seasoning to eliminate the chewy texture other dried meats have (although, we’re biased). And the best part is that quality Biltong can be found in the UK. We at St Marcus are here to serve you the quality product to remind you of South Africa. So whether you are a homesick expat or a fitness-minded enthusiast, make sure you have you Biltong at an arm’s reach.